Not getting a relaxer while doing the series. 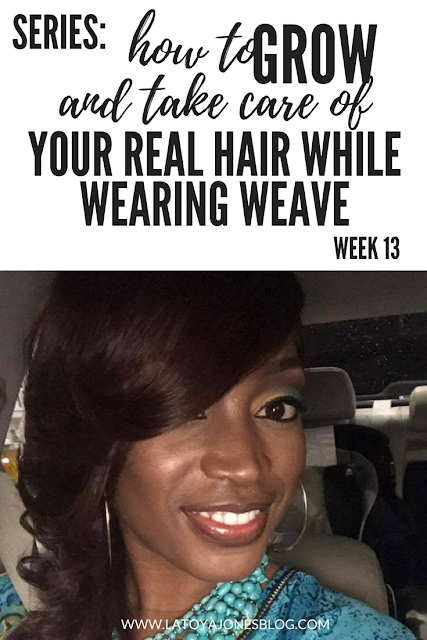 One note I would like to point out about the last bullet point is that it is not required to NOT get a relaxer in order for your hair to grow. However, my logic is simple. If I am not going to be wearing my real hair anyway, what is the point of getting a relaxer? My hair is going to be braided up for 6 months so getting a relaxer right now would be pointless. Once I am done with the series and am ready to start wearing my real hair again, please believe I will most definitely be getting my relaxer again. The only bad thing is that it seems to get thicker and thicker as the weeks pass by but that is why I try my best to always let someone else do the braiding for me. I can handle the shampoo and conditioner, as well as the blow dry. But, braiding my own hair has never interested me. As a matter of fact, I don't like it at all but sometimes that is not an option for me and you just have to do what you have to do. Unfortunately, like I mentioned earlier I had to braid my own hair this time. Also I did not start braiding until late at night so in order to cut down on time I braided my hair larger than I normally would. This is not something done on a regular basis but I was tired so it is what it is! This week I chose to wear the same wig I wore last week. I just really love this red hair plus I didn't prep the wig that I had in mind to wear so there it is. It is a good thing that I have many wigs (yes I make them all) to choose from. Like I stated before, I'm loving this series. I see why people love weave so much. It's so versatile, and easier to maintain but I am kind of missing my real hair just a teeny tiny bit. I am more curious to see exactly how long my hair is so far but I'll wait until the series is over. Remember ladies, the goal of this series is to GROW your hair while wearing wigs so it is important not to neglect your real hair underneath. Maintaining it is crucial in order for the series to be successful. Hey LaToya, I can tell a difference in my hair just from wearing these crochet braids. I have been wearing crochet braids for at least three weeks and really see a difference in my hair. I also haven't put any chemicals in my hair, besides just washing and conditioning my hair.